We stock a wide range of quality "proven and tested" USB to RS232 (Serial) solutions including 2-way, 4-way & 8-way solutions. 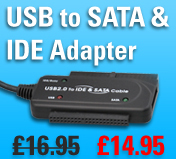 We only supply USB to Serial cables that use either the FTDI or Prolific Chipsets. All of the USB to Serial Cables come with Drivers and Com Port Emulation Software - you can change the defined Com Ports and the Buad rate speeds. Our USB to RS-232 work on Windows 7 PC's (just read the customer feedback on each product) and they have been used over the years we've sold them by home users and large blue-chip companies because they just work! We stock a wide range of quality "proven and tested" USB to RS232 (Serial) solutions including 2-way, 4-way & 8-way solutions. We only supply USB to Serial cables that use either the FTDI or Prolific Chipsets. All of the USB to Serial Cables come with Drivers and Com Port Emulation Software - you can change the defined Com Ports and the Buad rate speeds. We have several USB to Serial adapters and USB serial cables including the AUM100 and the VE229 models. Both of these highly regarded adapters have been sold by us for over 4 years and just work time after time and in whatever situation our customers throw at them. We have customers using these hooked up to telescopes in University Grounds, on boats in the Solent, connected to Psion Hand Held Computers, Conencted to Speed Trap Radar detectors and so the list goes on...The AUM100 USB to Serial Cable features a 1.8m cable that terminates in a 9 Pin Male Serial Connector wheras the VE229 is a simple adpater that comes with an optional 1m USB cable - you can of course use it with a longer or shorter cable or just as an adapter. The AUM120 cable is a USB A/Male Cable that terminates in X2 9 Pin Male Serial connectors - allows you to connect to two seperate serial port devices - each serial port can be controlled seperately and the baud rate(s) and Com ports etc all defined seperately. The USB to Serial cable (AUM120) uses the highly regards FTDI Chipset. Again, another proved cable thats been in our Serial Adapter portfolio for 3-4 years. The AUM140 is a USB A/Male Cable that terminates in X 4 9 Pin Male Serial connectors - allows you to connect up to four seperate serial (RS232) devices to a single USB Port.